Thank you to all those to attended our 2018 conference on Nov. 3rd! … 2019 conference details TBA summer 2019! 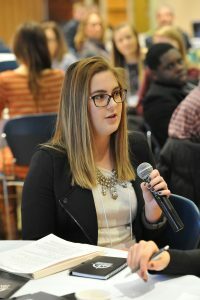 Each year, the RI Conference on Values-Based Leadership offers student leaders and leadership development professionals from colleges and universities across the state, a valuable opportunity to come together and explore the choices and challenges inherent to effective values-based leadership. Through interactive workshops and presentations, participants will examine their own values, attitudes and beliefs, while benefiting from varying perspectives, peer support, and the guidance of leaders and ethical thinkers from the local business community. Conference participants will contemplate what type of person and leader they wish to be, helping them to develop the conviction to live out those values in their leadership with purpose and integrity. Through the establishment of this supportive and engaging collegiate network, we hope to strengthen the effectiveness and pool of student leaders in Rhode Island. Administrators, faculty and staff attending the conference with their students will also have the opportunity to network and collaborate with colleagues around leadership topics during the conference day. If you are a person with a disability and require an assistive device, service, or other accommodation to participate in this conference, please contact the Central Reservations Coordinator (401-865-2070; M-F 8:30a.m. – 4:30p.m.) well in advance.